Data sharing initiatives can be hyper-local, but they are all subject to the same federal laws regarding privacy and consent. Working through Data Sharing Consent or Release of Information forms can be almost frightening in this highly regulated landscape. During a Deep Dive workshop at the 2018 All In: Data for Community Health National Meeting, attorneys from the Network for Public Health Law explored when consent may or may not be the key to sharing data and how policies and regulations governing health care, education, and behavioral health data like HIPAA, FERPA, and 42 CFR Part 2 impact consent. 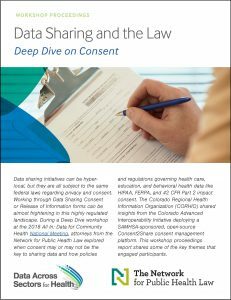 The Colorado Regional Health Information Organization (CORHIO) shared insights from the Colorado Advanced Interoperability Initiative deploying a SAMHSA-sponsored, open-source Consent2Share consent management platform. Data Across Sectors for Health and the Network for Public Health Law developed this workshop proceedings report, which shares some of the key themes that engaged participants.